That smile. That presence. That fashion sense. Yup, Richard Feynman. First we’re published together in the CRC Handbook of Nanotech, now we find ourselves playing the same second fiddles on the same page to the infinitely more photogenic Giselle Itiê. Not bad, considering he checked out before I entered my teens. I have no idea what Pablo Nogueira’s article says, but I do know that the folks at Revista Latitude (that’s Latitude Magazine!) spiced the text up with a few primo images available from Rocky Rawstern’s much appreciated nanotech-now.com gallery. 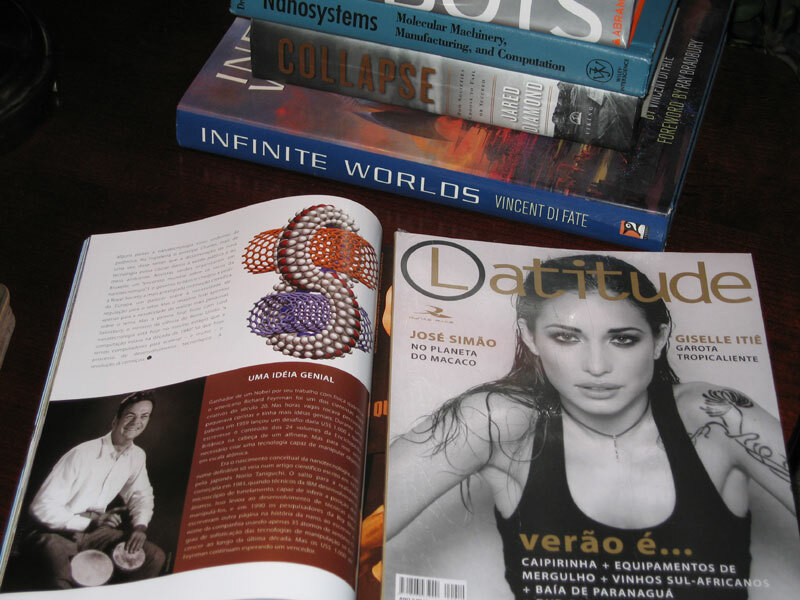 Revista Latitude and Revista Top are very visual magazines. The now-ness of a Rolling Stone with the imagery of a National Geographic. I didn’t understand a word but I much enjoyed turning the pages. It does a researcher good to see that a magazine can make science work in same binding with photojournals of exotic destinations or fashion on location. Calfskin bongos, international models, molecular nanotechnology. I think anyone who finished “Surely You Must Be Joking” would conclude that the man would approve.